Marble Fiesta® is an exciting new style that is appealing to look at while providing all of the attributes that make rubber flooring a great choice! Marble Fiesta® colors coordinate with other Roppe products and can be mixed and matched with tile, treads, wall base and accessories. Be creative with beautiful, versatile and unique Marble Fiesta® products. 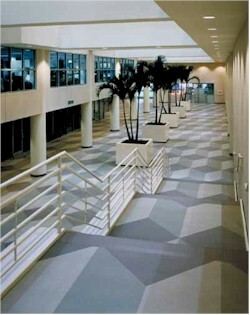 No matter what the project, 100% PVC free Roppe Pinnacle rubber base is ideal for the job. Pinnacle is the professional’s choice, because this SBR rubber base is highly durable and extremely flexible, allowing for easy installation around columns, corners and architectural curves. Low cost and good looks highlight Roppe’s Type TV thermoplastic vinyl base. It’s extremely durable without sacrificing attractiveness, and very economical because it’s made from PVC vinyl. Each job is different, every environment is unique. And Roppe offers a full range of rubber and vinyl flooring products to accommodate your changing needs. With cutting-edge technology and continuous innovations in products, styles, and colors, Roppe is your One Source for every flooring need. From wall base and tile to stair treads and accessories, you’ll find fashion with function and affordability with aesthetics. With Roppe, you get a Total Flooring Solution with performance you can rely on; products to fit every application; and unequalled color and design capabilities. All with the quality that gives you true value and cost savings for years to come. One look and you’ll see why Roppe is your One Source for Total Flooring Solutions.